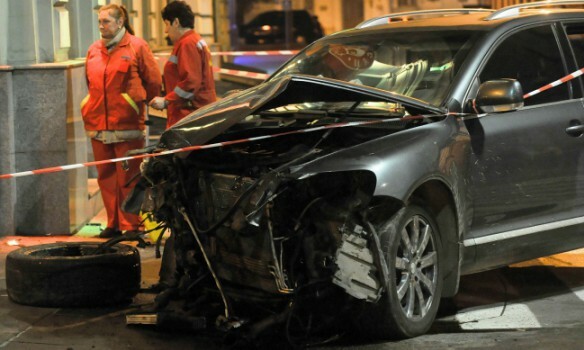 The second participant of the car crash in Kharkiv Gennady Dronov was served with charge papers as Sergy Perepylytsia, the advocate of Dronov reported to 112 Ukraine. 'The classification is the same under part 3, article 286 (Violation of the road safety or service of the vehicle by the persons that led to the death of a few people) of the Criminal Code of Ukraine. The pretrial investigation body thinks that there are the grounds for this. But we do not agree', Perepylytsia noted. As we reported earlier a Lexus ran over a group of pedestrians in Kharkiv, northeastern Ukraine, on Wednesday evening. Alyona Zaitseva who drove the Lexus violated the road traffic, crashing into Volkswagen Touareg driven by Gennady Dronov which threw her car towards the pavement. Both drivers survived, but Lexus ran over a group of eleven people. Five pedestrians received lethal injuries; another six were taken to a hospital with injuries of various degrees of severity. Zaitseva was detained for two months without a right for bailment. The court revoked her driver’ license and arrested both cars that participated in the accident. Earlier, the prosecution stated that Zaitseva used opiates not long before the tragedy occurred. According to the information of the defense, the suspect took the sedatives. The version of the Zaitseva defense is that the driver of the Touareg is guilty as he moved on the yellow traffic light. The defense of Gennady Dronov denies the accusation and claims that the driver of the Touareg moved on the green traffic light. Dronov is the witness in this case but the police claimed that his status can change. Later, the court refused to recognize Dronov sustained.